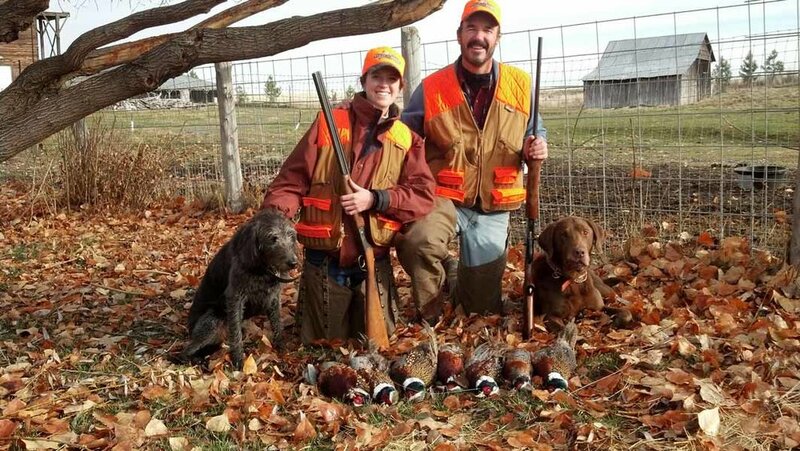 Field N Marsh Outfitters provides Upland Game Bird hunting for Pheasant, Grouse, Chukar, and Huns. Depending upon the season and location you may hunt for Mourning Dove, Valley Quail, Mountain Quail, Merriam Turkey, Rio Grande Turkeys, and other wild game birds. Sporting Clays and Shooting Preserve Hunts are also available. Find out why hunters believe our terrain, hunting habitat, and dogs are the best! Half day or multiple days, hunt a different area every day. Available in season are wild bird hunts for Valley Quail, Grouse, Mountain Quail, Pheasant, Chukars, and Huns. Upland Game Preserve Hunts generally start in August and continue to March 31st the following year, every year. Wild Bird Hunts are dependent on the posted legal hunting seasons for that species. Usually wild bird hunts start in September and run through late January. Please contact us for specifics. Dove Hunting with the Outfit! Experience an Oregon Mourning Dove hunt with us. Southern tradition and style in the Great Pacific Northwest. We are the only outfitter in the Northwest who offers these types of hunts. Dove season is September 1 to October 31. We book Dove hunts beginning in April and continue through the month of September even though the first two weeks of the season are the best. We provide the hunting fields, the dogs, the birds, lunch, and some great camaraderie in North Central Oregon, Grass Valley and Eastern Washington. Dove season is September 1 to October 31. We are accepting reservations beginning in April for our September Dove Hunts. Reservations accepted only on space available basis. 8 Pheasants or 13 Chukars released per hunter, or, 4 Pheasants and 7 Chukars per hunter. All Day Guided Hunt - Includes dinner, appetizers, afternoon snack, guide, and dogs. Full Day Unguided Hunt includes lunch. 4 hunters minimum, 8 hunters maximum. 8 Pheasants or 13 Chukars released per hunter. Includes dinner, appetizers, lunch, afternoon snack, guide, and dogs. Overnight Hunts $475 to $525/day (overnight hunts Includes dinner, appetizers,). Guides and dogs may be added to any package and custom hunt to lend their vast knowledge of hunting areas. (5 person maximum) If you have an inexperienced dog, bring it along for some training, oftentimes Jeff Miller, 30+ years as a dog trainer, is guiding with you and he can give you some pointers on your dog's performance. It's like a free training session.